Sign up for Broadjam today to follow Andrew Syn, and be notified when they upload new stuff or update their news! Though his influences range from Metallica to 3 Doors Down, Andrew Syn's sound is pure pop-rock power, which can best be described as a mainstream rock/pop proposal. Never underestimating the genre, Andrew brings familiar elements to his music, but never leaving out his guitar driven background. On the live scene, Andrew has shared stages with many local and regional bands, and two well-known acts, once in Hidalgo, TX's "Dodge Arena", playing along with Maverick Records artist Tantric, and in Cumbre Tajin 2005, playing along with mexican rock icons Molotov. Andrew Syn's growth in his songwriting and performance skills has been guided by his will to never feel satisfied, and his rebel attitude to always be on top. 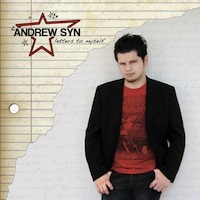 2008's "Letters To Myself" promises to breakthrough Andrew Syn, and position Andrew as one of the best acts in years to come.